This salad is simple, yet robust in flavor and texture. And it's nice because it can be made a few hours ahead of time and pulled out from the refrigerator ready to go. The instructions below have a portion of the dressing, the cheese and dried cranberries to be added just before serving, but it seemed to work just fine to add everything at once the two hours ahead. This recipe comes from Ina Garten's newest cookbook, Make It Ahead. 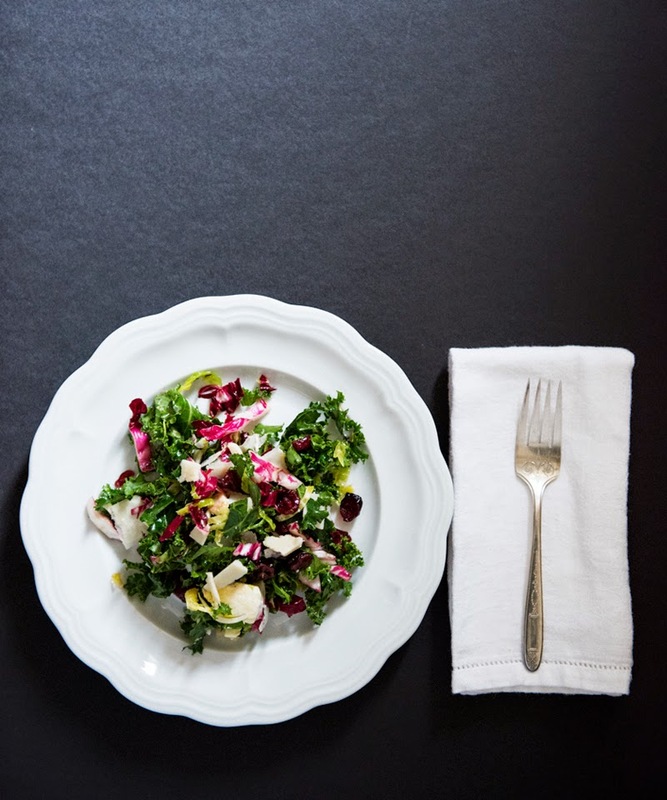 With a sharp knife, thinly slice the kale, Brussels sprouts, and radicchio, as you would cabbage when making coleslaw. Place in a large bowl. In a small bowl whisk together the lemon juice, olive oil and a pinch of salt and pepper. Pour enough dressing on the salad so that it is evenly coated. Reserve the remaining dressing for just before serving. Ideally let the salad marinate in the refrigerator for an hour or two. Using a sharp knife or vegetable peeler, cut large shavings of the Parmesan cheese and place atop the salad. Gently toss together with the dried cranberries and the remainder of the dressing. Taste for salt and pepper. Serve cold or at room temperature.